in competitive US business translation market, launches new website and digital brand. 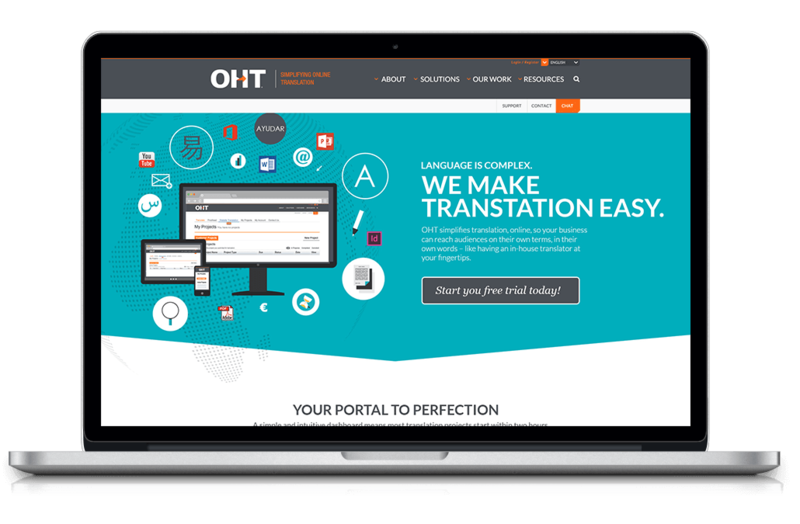 OHT, One Hour Translation, has emerged as the largest online professional translation company, providing unique translations for various content in 70 different languages to customers across the globe. With company growth, has come an ever-increasing need to gain brand visibility as the primary translation company in the industry. Along with maintaining customer loyalty, the company’s immediate objective involved communicating its services in a manner that would impact all market segments and attract new business. OHT turned to trusted partner, Borenstein Group, to convert OHT’s company objectives into comprehensive strategic messaging, that resonates with current and prospective clients who need high-quality for translation projects on a regular basis. OHT’s main objectives were to distinguish itself from the competition and to inspire all key stakeholders. To accomplish this, Borenstein Group revamped OHT’s corporate identity with a logo and website design that captured the main objectives of providing fast and accurate translations, as well as introducing the tagline, “In-House Translation, At Your Fingertips,” which emphasizes the benefits and values of working with OHT. The website redesign featured a responsive framework, providing users with a consistent experience, no matter what device they use to visit the website. In addition, the website’s content was strategically displayed and presented, providing users with an intuitive user experience and ease of access to wanted information. This created a high-end user experience that allowed users to better understand OHT’s differentiators. Borenstein Group assisted OHT with internal business development goals by providing them with updated corporate materials, such as new business cards, letterheads and PowerPoint proposals intended to spark trust and loyalty of potential clients. Through the website redesign, Borenstein Group has empowered OHT with the tools needed to position itself as an industry leader. By strengthening their core messaging and designing a consistent brand image to support it, OHT is now poised to expand their market and substantially increase ROI, by effectively showcasing their language services in an impactful manner. With the help of Borenstein Group, OHT now has a consistent and impactful digital brand with the foundation to propel the company toward a bright future.